Trail cameras are great for tracking bears, deer, and many other varieties of wildlife. But nearly every trail camera requires you undertake a considerable inconvenience. Heading out into the wilderness and setting up the camera isn’t too bad. But heading out every time you want to check your photos? Things become tiresome or impractical. Cellar field modems can help you largely get around this problem. They help you collect your photos wirelessly using the internet. In most circumstances, that’s far superior to micromanaging SD cards. Sooner or later you’ll need to provide maintenance for the modem. But with the right setup, maintenance trips can be few and far between. 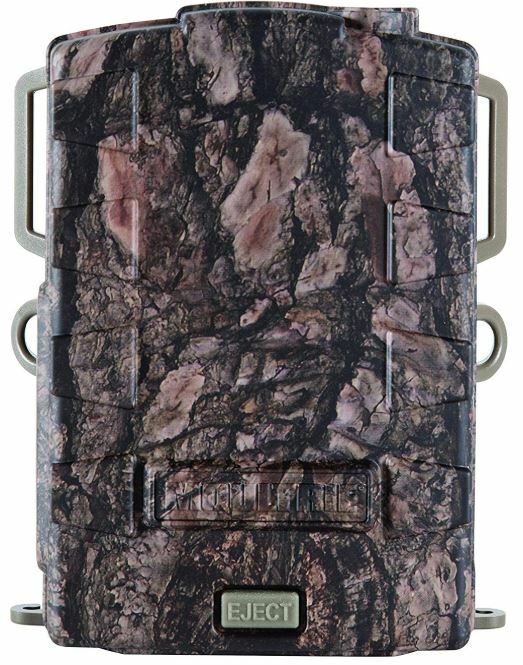 The Moultrie Mobile MV2 Cellular Field Modem is made to transform a standard Moultrie game camera into a wireless-supported wireless game camera. Making use of mobile network connectivity and its own internal power source, the MV2 can let you know if some creature walked your camera by within moments of it occurring. Images are sent straight to your tablet, smartphone, or PC. The MV2 can be used with essentially Moultrie camera made in the past four or five years. 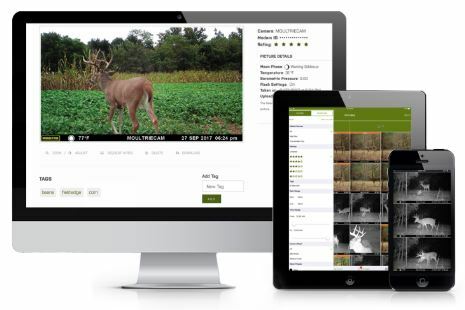 Because Moultrie has such a huge variety of game cameras, that makes the MV2 is adaptable by default. Among some of the most noteworthy options, you’ll find cameras with Infrared LED options for night vision, cameras long-distance flash capacity, cameras with significantly raised resolution, and so forth. The exterior chassis of the MV2 is covered with a camouflage pattern. Colored shades of brown and black, made to resemble the bark of a tree, and helping to disguise the modem. The camo can minimize the chance of a passer-by bothering your things, and make your setup less likely to draw the attention of wildlife. Moreover, hiding away the box with camo doesn’t leave an eyesore in the beauty of nature. If we can’t convince people to stop littering, perhaps we can convince manufacturers to color everything like the MV2 Cellular Field Modem. The outer edges of the modem’s casing are built with several mounting hoops. Among them you’ll find a molded strap loop, a Python cable loop, and ¼”-20 mount. There are also USB cable strain-relief loops, which can be useful for managing the USB connection cable between the camera and the Moultrie Mobile MV2 Cellular Field Modem. Among those many options for installation, the most noteworthy is probably the Python loop. If you’re actually concerned about theft or someone stumbling across your equipment, then you probably want more protection than some thin camouflage. The Python loop can help you lock the Moultrie Mobile MV2 into an immobile position. Towards the bottom of the Moultrie MV2, the base has a large EJECT button. It’s a quick and easy way to access the guts of the modem without having to unmount or unlock the panel each time you access it. You can pop-out the battery tray and access the onboard USB port from here. The external power port can be used to connect an optional power accessory, which we’ll explore in a moment. On its backside, you’ll find what appears to be the rear-end of an ordinary router. It uses a standard LED array to let you know about the status of the battery life, the signal strength, and the status of any attempts to connect. There are also LEDs indicating when you’ve got the camera properly connected. These LEDs should allow you to diagnose and address virtually any problem you might encounter while using the Moultrie Mobile MV2. The Moultrie Mobile MV2 Cellular Field Modem is based on Verizon’s 4G network. Because this isn’t a GPS network, you will need to position the modem in a place where it can receive cellular signals. Without this turning into a commercial for Verizon, it’s reasonable to say their network is fairly large. Most people in most circumstances aren’t going to have issues with connectivity. But there are always corners of the world where cell service isn’t available. When you’re traveling through a valley between two mountains, and there isn’t a big town nearby, there’s a good chance you’re not going to find any service. If you’re uncertain there’s service in the area where you’d like to install the modem, it’s not terribly difficult to check the area using a cellphone or even a radio. There are six data plans for the MV2. The most basic plan is about $5 a month, and it allows for the transmission of about 100 images. Moving to $10, your bandwidth capabilities stretch out to 850 photos. The highest tier provides an estimated 12,000 images for about $50 monthly. 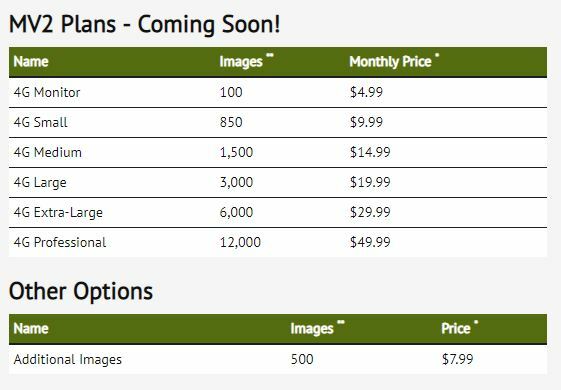 You can also buy 500 images as a group for $8, without a monthly subscription. There are reasonably good options for every type of need. But it’s important to note these images totals are simply estimates. The actual amount of data you get from your subscription will depend on the size of the images you transmit. Higher resolution images take up more data than lower resolution content, something to keep in mind while choosing a camera and customizing its settings. Actually getting ahold of your photos takes place through the Moultrie Mobile app. It’s supported on both iPhone and Android platforms. It’s also free, and reasonably simple to use. You can also view small thumbnails of a shot before deciding if you’d like to use your data to send a larger version of the image. That way, you’re not chewing through your data every time a squirrel or bird happen to catch the attention of your camera. The Moultrie Mobile MV2 Cellular Field Modem and its internal antennas are powered with the support of eight AA batteries. Eight is actually the minimum configuration, it can hold a full dozen. Depending on the camera you’re using, you may need that many. The MV2 gets far better performance from lithium batteries, but alkaline batteries will work just fine. How long can you expect those batteries to last? It heavily depends on how you end up using the Moultrie Mobile MV2 Cellular Field Modem. You can make batteries last longer by changing the transmit frequency setting between once per day, twice per day, or immediate. And you can squeeze out more battery life by using a high performance SD card, or keeping the firmware of your cameras up-to-date. If you’re using the MV2 somewhat infrequently, and you expect to receive one or two alerts per week, then you can easily get three or four months from the batteries. If you’re sending photos far more often, you can expect far more trips to visit the batteries. But those problems can be alleviated, too. Apart from the numerous camera options mentioned earlier, Moultrie has many accessory options for its MV2 Cellular Field Modem. Supporting solar paneling, the MV2 makes it possible to avoid dealing with battery replacements entirely. Additionally, the MV2 can be paired with a battery box containing a rechargeable 12-Volt battery. There’s also EZ tree mounts, universally sized camera stakes, and all the additional wiring options you might need for these setups. Most of the time, it’s worth throwing out the user manuals for user-friendly networking equipment like the MV2. But this manual may actually prove quite useful. It illustrates a step-by-step installation process, making the whole thing about as simple as putting in the batteries. The user manual also gives you a detailed list of what different LED indications mean. If the awake-LED and signal-LED are both on, and the server-LED is off, then you can immediately narrow the problem to two possible causes. With an exhaustive list of possible causes and solutions, even someone who isn’t tech-savvy can take steps to address virtually any problem the MV2 might encounter. When it comes to bad weather, the Moultrie Mobile MV2 Cellular Field Modem and all its companion accessories are equipped to last. The only significant limitation to keep in mind is cold. Batteries don’t do well in the cold. Once there are freezing conditions outside, the MV2 won’t see much useful deployment. The included USB cable is steel braided, intended to help it be both weather and animal resistant. While many average office modems offer a one-year warranty, the MV2 and its rugged construction includes a 2-year warranty. The Moultrie Mobile MV2 Cellular Field Modem also includes a basic mounting strap. It makes it fairly simple to attach the MV2 to posts and trees. But if you’re looking for a more complicated or more secure installation, then you’re going to have to be ready to grab a few accessories. Who Should Choose the Moultrie Mobile MV2 Cellular Field Modem? What makes this modem so compelling is that it’s not an all-in-one kit that ties you down with hard limits. You can select between a dozen different cameras options, reporting options, and mounting options. Though the MV2 was clearly made with hunters in mind, this array of options provides few limits. Actually using the MV2 is as easy as sitting back as the photos roll in. The gear is rugged. Your data options aren’t constraining, and the plans are fairly affordable. You don’t have to walk out to a hunting spot to pull your SD cards by hand, you can check them from the comfort of your couch a hundred miles away. And compared to using physical memory cards, that can save you hundreds of hours of effort. Once installed, you can start receiving notifications almost immediately. With so much working in its favor, it’s easy to see why so many people like the Moultrie Mobile MV2 Cellular Field Modem. It’s hard to imagine someone who’s needs are grossly exceed by what it can provide. And as Moultrie continues to build and adapt new cameras and similar equipment, the MV2 only stands to get better with age.